Hello to everyone s!, How are you? In Madrid today's snowing, so, personally, enchanted life :). The snow brings back many childhood memories, Fonsagrada as were common in heavy snow almost every winter and that, for children, was a blast. In the end, such beautiful memories….And delicious cookies to sweeten! 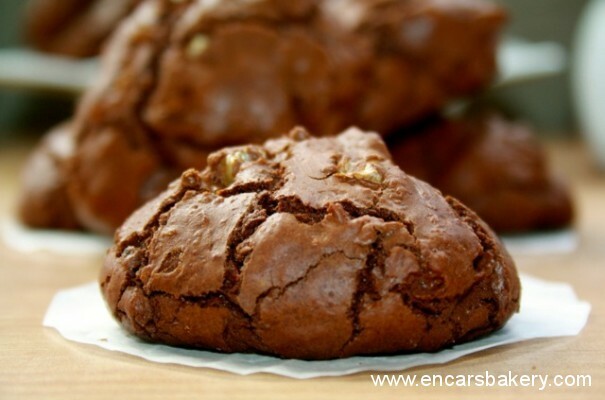 Here you have these brownie cookies that may be more rich, Is a vice! I tell you and how to prepare, as always, Facilísmas! Sift the flour and baking, and reserve. Chop the chocolate and Melt, together with butter, in a pan in a water bath. Mix and reserve. Beat the eggs with the sugar. Add the chocolate and mix well. Add the flour to the mixture and mix well with the whisk. Chop the nuts finely (amount to taste) and add to the mass, the you can “sprinkle” balls them before baking dough (I did well). Forramos oven tray with baking paper and handed tablespoons of dough. I put two and not flatten cookie, but you can make them smaller and cheaper if you so desire. Although not expand much, do them too close together not. In the trays all goats. Boil each tray, in preheated oven at 175 º C, about 15-18 minutes. If you make smaller cookies, with 10-12 minutes will be enough. Once out, and after a couple of minutes of rest, the pass to a rack to cool completely. I hope you feel encouraged to make, you will love. For fans of brownie in all its forms, are a great way to enjoy.